My artmaking practice predominantly involves designing and making unique functional furniture, preferably showcasing Australian grown timbers. I have always been interested in making and I initially got into furniture making while building built-in wardrobes, cupboards, bookshelves and a desk in our first house. About 15 years ago I decided I wanted to make finer and better quality furniture than I had been and enrolled in the Visual Arts Access program of evening courses run through the ANU School of Art. These classes provided me with an excellent grounding in furniture making techniques. In 2014 I was fortunate enough to be able to retire from my public service job to undertake a Bachelor of Design Arts in Furniture through the ANU. I am attracted to forms that outwardly appear quite clean but which have underlying or internal structural elements with an architectural quality that belies that apparent simplicity. I am also interested in the sophistication of Chinese and Japanese joinery compared with the Western equivalent. Elements of both of these appear in my work. As part of my current Honours studies I am looking at the theory around the aesthetics of complexity, and the different cultural approach to aesthetics in Asia compared with the West. My craft is influenced by Asian furniture design, particularly from the Ming and early Q’ing dynasties in China as well as traditional Japanese and Korean furniture. I am also interested in how these styles have influenced western furniture designers and makers such as Edward Godwin, Charles and Henry Greene, Hans Wegner and others. There are two pieces that I am particularly fond of. 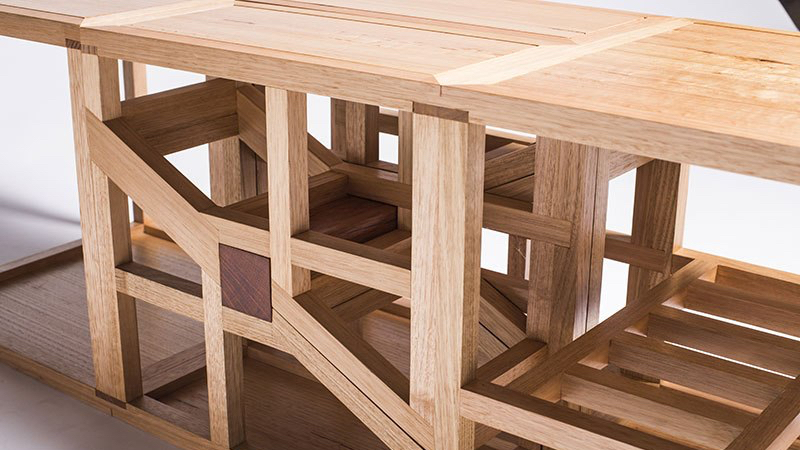 The first is the coffee table/side table ‘Tsugime’ based on a Japanese scarf joint used for joining timbers, in the Craft ACT Emerging Contemporaries exhibition. The other is my ‘Reuleaux stool’ made in the second year of my course, inspired by a traditional Chinese design and using the Reuleaux triangle (a rounded-sided triangle) as the key design element. I am currently working part time for a furniture restorer which I am enjoying and from which I am learning a lot about traditional making techniques and the types of joinery and making techniques that stand the test of time (and the ones that don’t). It is also exposing me to the work of a wide range of Australian furniture makers and designers that we don’t often hear about. I am also currently undertaking my Honours at the ANU to complete my degree. Over time I would like to build up my own practice focusing on commissions and small production runs of my own designs. I am also interested in making musical instruments such as acoustic guitars and mandolins, an interest that has grown considerably after undertaking a guitar building course in 2016. I would like more people to understand and value the amount of work that goes into making well-crafted, unique functional works and look to acquiring good-quality pieces that will last because they are both well-designed and well-constructed, rather than following trends and buying cheap, poorly constructed pieces that will be consigned to the waste stream in a relatively short period of time. Along with the current Craft ACT: Craft + Design Centre Emerging Contemporaries exhibition, I will be exhibiting the ‘Reuleaux Stool’ and possibly some cutlery (made in a gold and silver-smithing elective course during my degree) at the Random exhibition at the ANU School of Art Gallery in July. There will also possibly be work included in the ANU School of Art Furniture Workshop Exhibition at the end of the year.